In continuation of this series of questions that will hopefully clear some questions I have had about this Occupy movement you’ll find below two more Q&A from a couple of young ladies I had the good fortune of interviewing. They are very kind and open to additional questions if you can think of any. Again, I am looking to help those of us who have become tired of the news coverage and stopped paying attention come to a better understanding of Occupy from an internal perspective. Enjoy. 2. What are simple facts people should know that are no longer keeping up with the media coverage? I understand being exhausted by the media, our style of reporting in the U. S. can make you feel that way. But this is pretty important stuff, I would ask people not to let the circus reporting aggravate you, but to seek the truth and you will find it. A good place to start is occupywallst.org. Some facts to know about the movement; There are calls to action, look out for these and participate however you can. Bank Transfer day sent a message to banks who acted unethically during the housing crisis, and now they stand to lose an astronomical amount of money in city contracts where citizens are pressuring cities and businesses to keep their money out of these banks. Something to know is that Clark Lytle Geduldig & Crandford proposed lobbying efforts to undermine the movement to prevent this feared loss of bank transfers. Are the different city movements different in goals? My understanding is that the movements all stand in solidarity with Occupy Wall Street though some may wish to show their solidarity in different ways. Growing fear of police brutality has caused some members of the movement to opt out of an occupation and replace it simply with working groups, calls to action and marches. Indianapolis is one city where members are still figuring out how they wish to show their support. For the most part all support the notion of non-violence, though many are not against civil disobedience (I.e. illegal camping). All choose to stand as leaderless movements and adhere to the process of general assemblies. 2. For those who have gotten lost in all the media coverage of Occupy movements, can you give us an idea of what the gist of all this is about. Are there specific items being protested or more of a ideological/system issue? 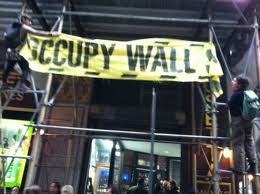 What's a brief description of what Occupy is all about? In a broad sense, Occupy to me is about giving a voice to the voiceless. For too long middle- and lower-class Americans have seen their participation in politics dwindle at the same time that corporations gain more and more power and politicians have less and less accountability. Big bankers and businesses caused the economy to collapse, and yet they were bailed out without there being any consequences for what they'd done. No new regulations, no new government oversight. Unemployment is still high, but these businesses we bailed out still won't create new jobs in America. They say they can't afford it, yet CEO pay has increased since the beginning of the recession. In addition, last year the Supreme Court ruled that a corporation can donate as much money as it wants to a political campaign, which makes elections completely unbalanced. There are also few restrictions on corporate lobbying, so you get a revolving door of lawmakers turned lobbyists and vice versa. All of this means that the interests of companies with a lot of money are more important than the basic needs and rights of ordinary people. It's about more than jobs, adequate wages, pensions, and things like that. It's also about transparency and safety. American businesses are exploiting the third world, and they're exploiting us, too.